This simple granola recipe is as healthy as it is delicious, making it a perfect Whole Food Plant Based granola. 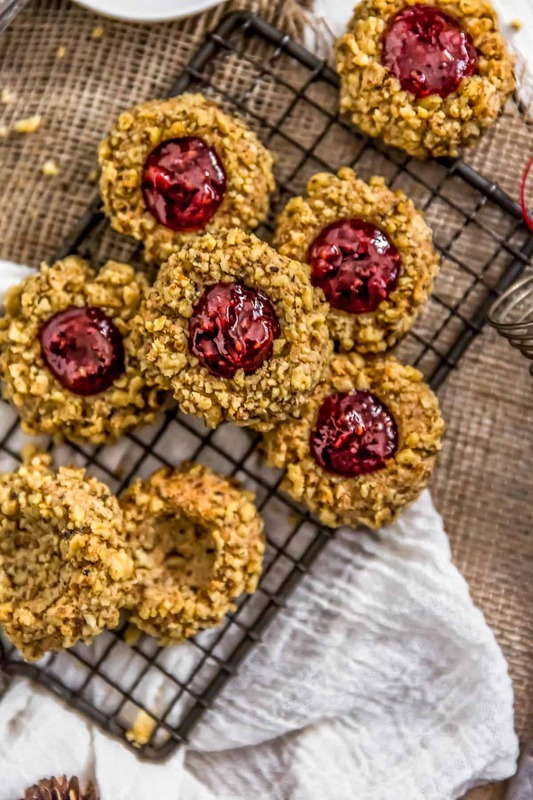 Made with beautiful slivered almonds, chopped walnuts, rolled oats, cinnamon, and hint of maple syrup. 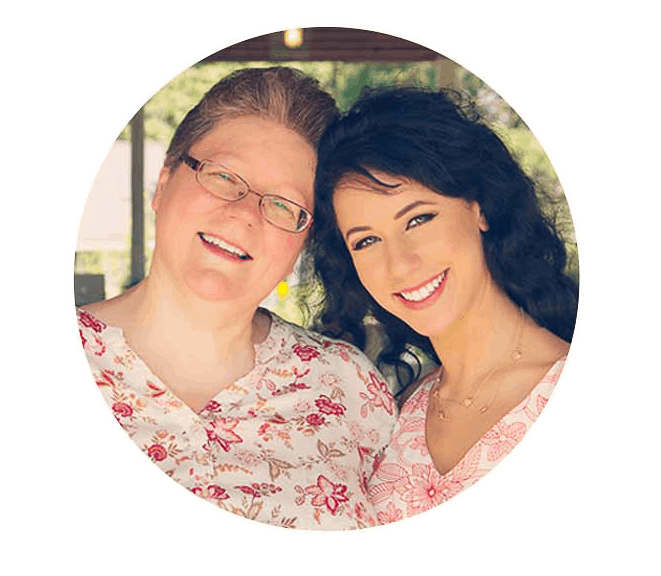 No oil, no refined sugar, no highly processed ingredients, and gluten free. I absolutely love granola, and this healthier version is so tasty and easy to make. 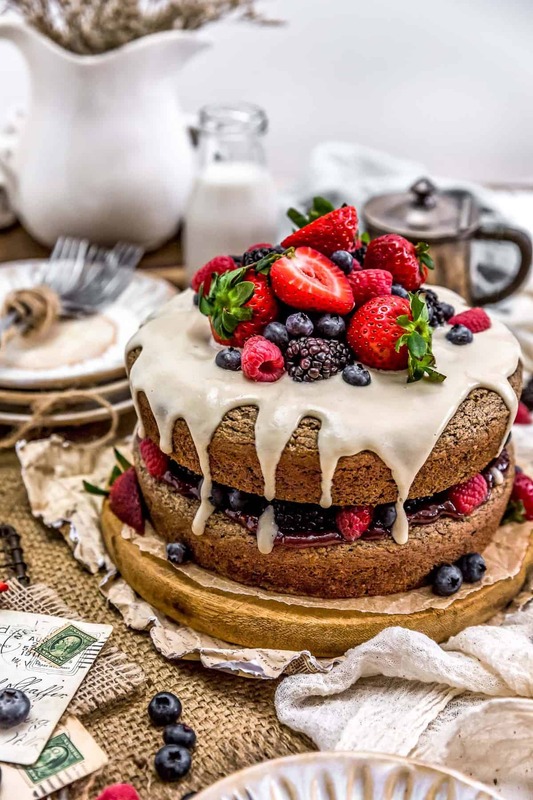 It is perfect for making breakfast and dessert parfaits. 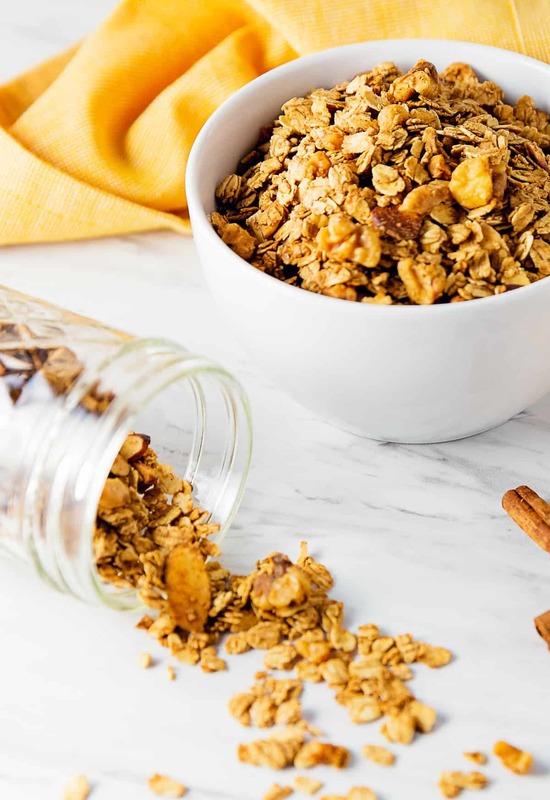 Since we use minimal maple syrup when making this recipe, you can expect that this granola does not stick together in the typical clusters. 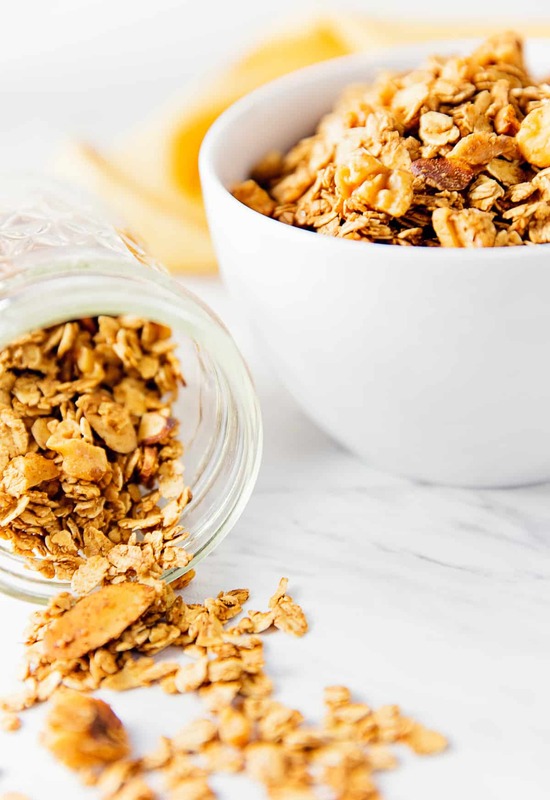 If you want more granola clusters, then you can easily add more maple syrup; however, since we are trying to minimize the sweetness, the maple syrup to rolled oats ratio is less than what you would typically find in granola. 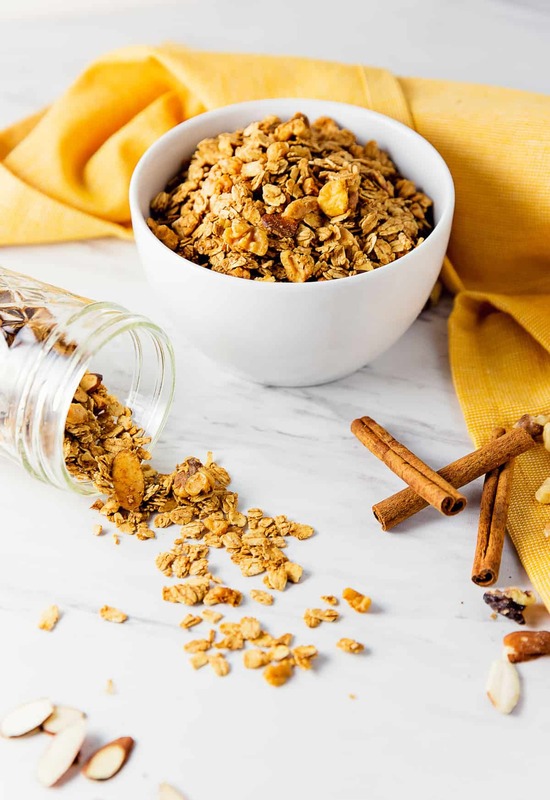 Our simple granola has a hint of sweetness, coupled with a beautiful cinnamon flavor, making it perfect for parfaits. Monitoring the oven is a must to prevent the granola from getting too brown or burning. We also used a silpat, non-stick silicone baking mat. I really recommend using one to prevent burning. If you don’t have one, use parchment paper, lower the temperature of your oven to 225 F, bake your granola longer, and flip it around more often. Just like Monkey, I love granola too. In a previous life, I bought tons of granola and ate it like potato chips, easily devouring a whole bag in one sitting. I mean, it was healthy after all, right? Not! Next time you go to the store, read the ingredients on a bag of granola. A lot of them will list sugar at the top of the ingredient list, which means it contains a lot of sugar, plus a lot of sodium and oil. 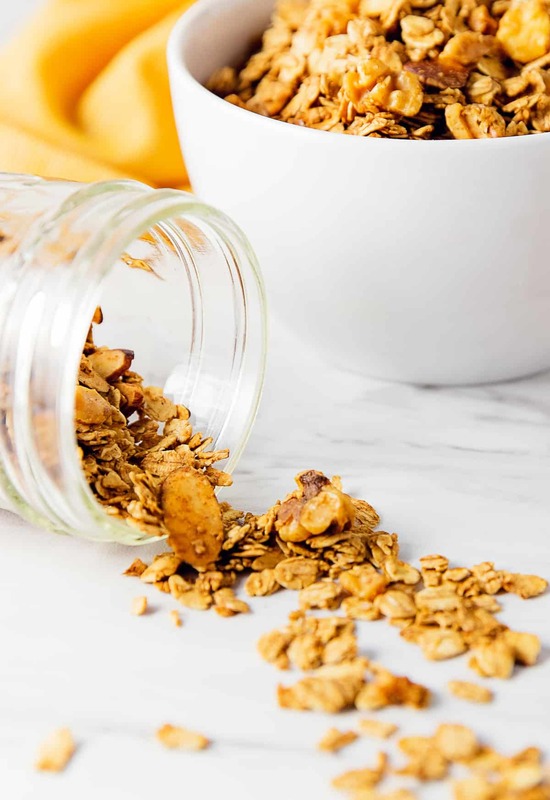 Making your own granola allows you the luxury of controlling your sodium intake, processed ingredients, sugars, and ensure that no oil is used. In a medium sized bowl, add the walnuts, almonds, rolled oats, cinnamon and sea salt. Mix well. Drizzle the maple syrup over the dry granola mixture, then stir well until everything is incorporated and coated nicely with maple syrup. Place a silpat silicone baking pad onto a cookie sheet. Then dump the granola mixture onto the silpat covered cookie sheet and spread the granola out evenly. Bake at 300 degrees F for 10 minutes. 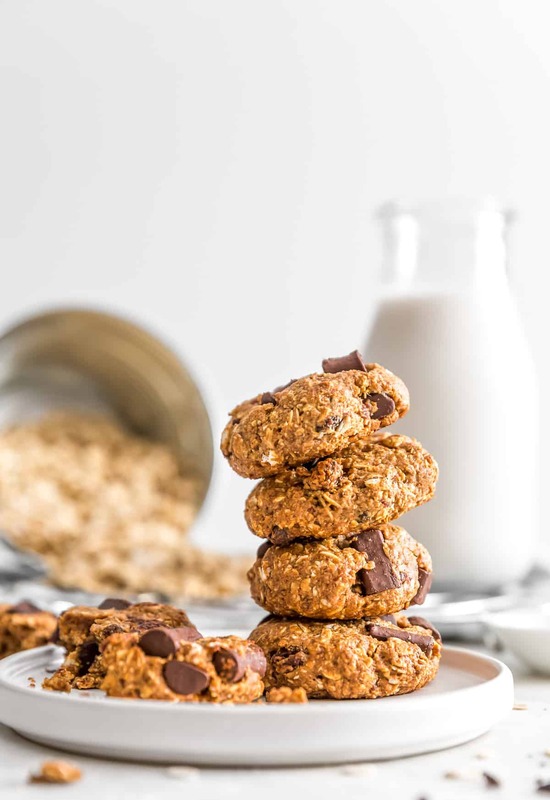 After 10 minutes, remove the cookie sheet from the oven and move the granola around the cookie sheet to ensure even baking. Place back in the oven for another 10 minutes. After 10 minutes have expired, then remove the cookie sheet from the oven, and again, move the granola around, and then place back into the oven one last time for another 3 minutes. Watch the granola very carefully as you do not want to overbrown it or burn it. *Granola Baking: Watch your oven carefully as some ovens tend to run hotter than others. Do not overbrown the granola. Storage: Store in a glass or plastic storage container.